Smilde Foods is part of Royal Smilde, a flexible, enterprising and international family concern since 1863. 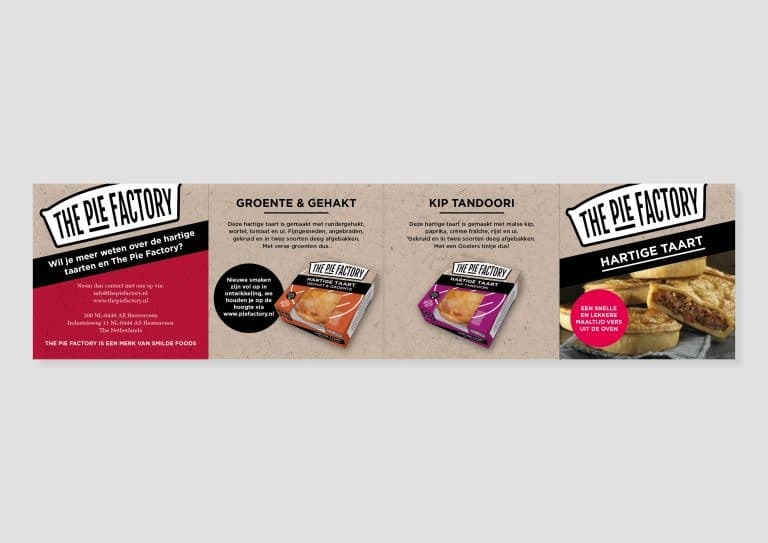 For Smilde Foods, our partner, Jonathan Morris developed the new strategy for The Pie Factory brand. enbiun's team worked out the rebranding into a clear-cut identity. 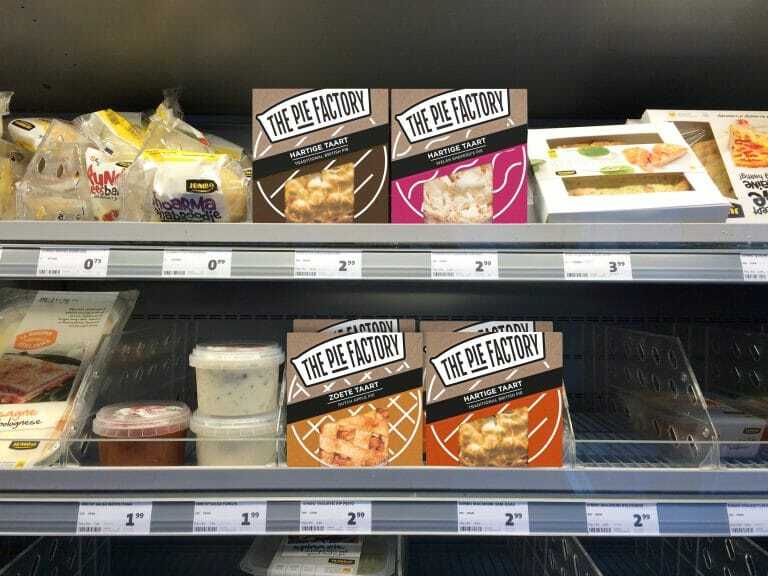 With this new brand identity, The Pie Factory makes the traditional English pie available for consumers in the Netherlands. The brand identity feels familiar for the Dutch consumer but stands out through the use of iconic elements, and speaks to an broader (and younger) audience. Savory pie is something still somewhat unknown in the Netherlands. The former package design was therefore not entirely suited to the Dutch consumer. The product description and name created confusion. The positioning and visual elements of the brand were no longer relevant for the current food market. An important change in the strategy is the introduction of the product indicators. 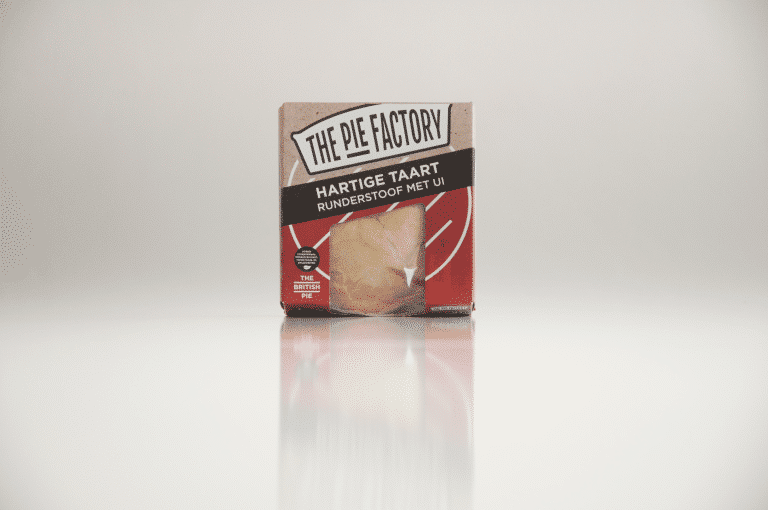 The Pie Factory now emphasizes the product indicator of ‘hartige taart’ (savory pie), with various ‘pie’ flavours. Hartige taart is leading, while the flavor is secondary. This new product indication is more recognizable for Dutch consumers, and caters more to their expectations. It also opens the way for new opportunities in the way of possible sub-products like apple pie or shepherd’s pie. Through the use of iconic shapes and fresh colors, it is also more likely to speak to a younger target audience. Pie has an iconic shape- both seen from the top as well as from the side. We chose the recognizable side-view or cross-section of the pie as part of the rebranding. Using this image also makes it possible to see the filling inside the pie. The use of this iconic shape forms the foundation for the brand. The logo needs to be dynamic and adaptable to more than one situation. 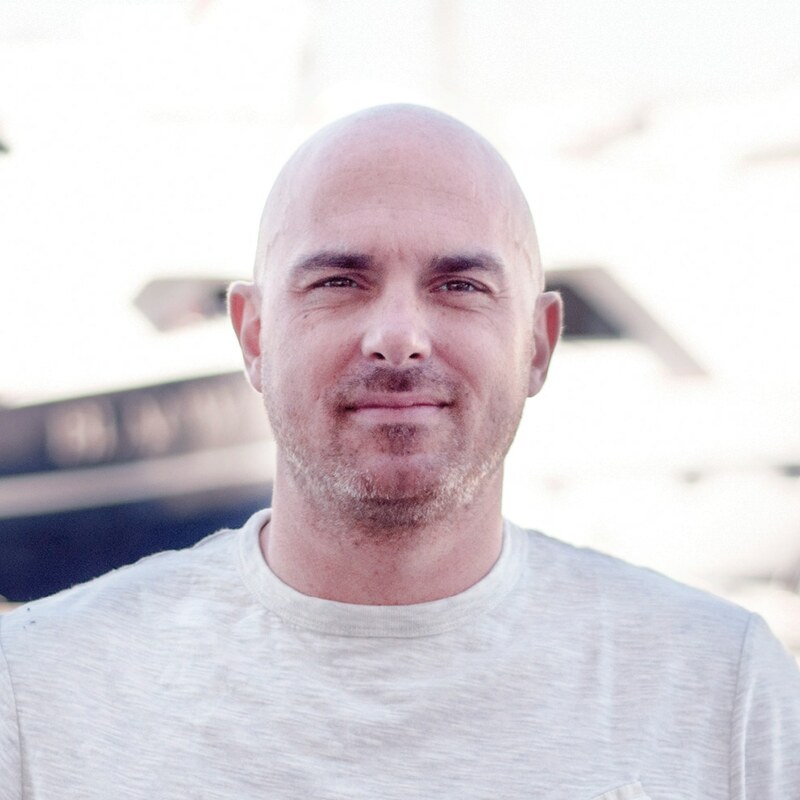 It must speak to multiple target audiences and stand out visually in current product language. The pie shape becomes the carrier for all brand imagery, video’s, how-to information, serving suggestions and ingredient information. The Pie Factory uses the shape of the pie as a carrier for the brand. The form is iconic, and by using repetition in the design it gets even more differentiating. The typography is clean and is further emphasized through the use of highly contrasting colors such as black and white or one intense color. All of these elements combined result in a brand that is playful, young and distinctive. The brand identity is best displayed using warm materials like light brown cardboard. This provides a strong link to food and beverage. The colors are used correspond to the flavor of each pie. These colors fall within the warm spectrum and in this way compliment the use of cardboard and the warmth of the product itself. It is a given that a product must distinguish itself from competition. This is why the choice has been made for a package that visibly stands out on the shelves. The white logo draws the eye and creates a point of rest. The bright colors and graphical style both play a supporting role. 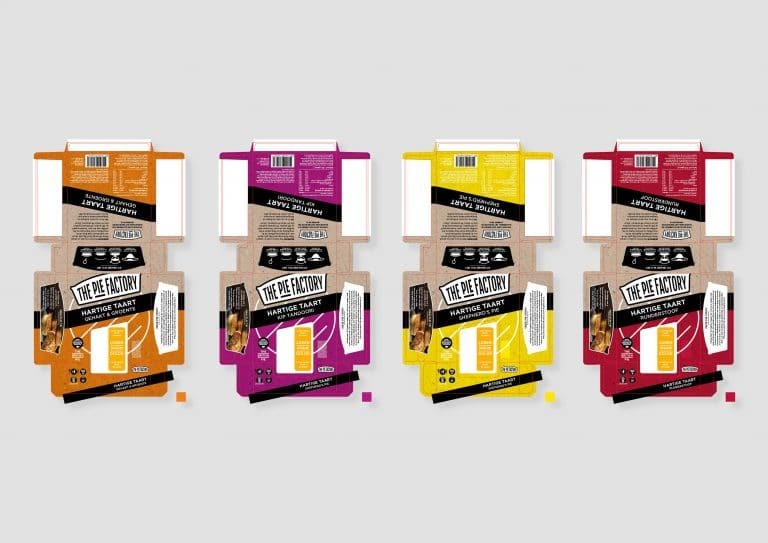 With its new appearance and designation, the brand is refreshed, rejuvenated and connects well with the current offering of convenience food products.